Swiss-based company DSwiss has announced their acquisition Madision, Wisconson-based competitor Entrustet this morning. The acquisition gives DSwiss’ SecureSafe product a wider reach into the US market. Both companies provide users with ways to archive digital assets and preserve passwords for heirs. Where SecureSafe’s emphasis is on security, Entrustet offered user a directory of lawyers who were knowledgable on wills and estate planning for digital assets which SecureSafe has said will be invaluable for their expansion into the US market. Entrustet also has a feature called Account Incinerator that deletes online accounts upon your passing. Entrustet clients were informed of the acquisition by email, which included a voucher for one year of SecureSafe service. They have until have until June 15th to redeem it by creating a new account on SecureSafe and migrating their own data from Entrustet. User data is available on Entrustet servers until July 31st, before it is permanently deleted. If Entrustet customers choose not to renew the paid version of SecrueSafe after the first year, they will have access to a free version with a lower level of password and document storage and fewer features. The paid version ranges from $1.50 to $12.90 per month. 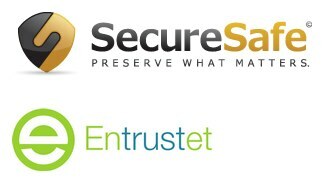 SecureSafe’s also invites Entrustet users to download their free iPhone and iPad apps. Formerly known as DataInherit, that name is now the digital asset beneficiary feature of the SecureSafe product. Both Entrustet and DSwiss were founded in 2008. In another post, I talked about assigning a digital executor to manage your online accounts and digital content after you pass. Often the next question is, how will your digital executor know your wishes? And how will they gain access to your accounts? I gave you some ideas in the article in The New York Times on The Digital Afterlife that involved keeping track of all your accounts and placing the information in an encrypted file, sealed envelope or safety deposit box. These options are the most viable for people who don’t have a very large digital footprint, who don’t change or add account information often, or who have basic needs. For people who are very active online, documenting accounts and passwords on paper may become unruly to manage and become out of date easily. To address this, some online paid services offer the ability to notify designated people of your passing, forward your final instructions or messages and safeguard your logins and passwords. But, I’ve come up with an easy and free way to handle all of your instructions, logins and passwords while keeping the information safe and secure: Gmail. STEP 1: Create a Gmail executor account to house all of the account information and specific instructions for your digital executor. STEP 2: Take an inventory of all of the digital assets you would like managed in some way after your passing. For instance, blogs, web sites, photo sharing sites, social networks, affiliate accounts, etc. Include on the list all of the email addresses you have registered and use on a regular basis along with their passwords. Don’t forget passwords to computers and the names or locations of important files on your hard drive. STEP 3: For each asset, send an email to the Gmail executor account with the name of the asset in the subject line. In your email, include a link to the service, user name, and password. Also include the email address that the online service is registered to and its password (your executor may need access your email account to receive confirmation and notification emails, or to reset any online service passwords.) Finally, in the email, include the instructions to your executor of what you would like to happen with each asset after your passing. STEP 4: If you want to leave any final messages, letters, videos or photos to be distributed or posted after your passing, you can email them with instructions to the executor account as well. STEP 5: With your lawyer, update your will to designate your digital executor(s), include the Gmail email address and password, instructions to the executor on how to proceed and any special considerations that are unlikely to change over time. Remember, it’s best not to change the password to the Gmail executor account as it will mean making a change to your will. STEP 6: Now, as you go about your day-to-day life, when your digital footprint changes – when you add an account, change a password, or you want to alter your intentions – simply update the information by sending an email to the Gmail account with the name of the asset in the subject line. Easy! As you are likely already at your computer or on your web-enabled mobile at the time you make a change to your online assets, sending a quick email to the Gmail executor account is a convenient way to manage your assets. Just remember, for security reasons, delete the email from your Sent folder. STEP 7: If you plan on leaving a final letter or a prepared message for your executor to distribute to friends, family or social networks, use the Contacts listing to make their job easier. Include the names, email addresses, phone numbers and primary social network user name, if appropriate, of the closest people in your circles. Having this information at the ready will help your digital executor to follow through on your final wishes. The process of creating a Gmail executor account will create a record of digital accounts and last wishes, in chronological order, making it easy to find your latest password or instructions. You may also choose to create labels for the emails to categorize them as work, household, legacy etc. Create filters to automatically label emails, auto-archive messages or even forward them to another email address. If you have more than one digital executor, you can set up filters and labels for each of them to find their instructions more easily. Or, you may choose to create a separate Gmail account for each executor according to their role. Just be sure that you send the appropriate information to the right Gmail address and include both in your will. You should periodically maintain your executor email account to delete out of date information, review your final intentions, update the information in the Contacts list and double-check that everything you want to be included is there. Ensure that the reset email for the Gmail executor account is up to date at all times. This is the alternative email address that Gmail uses should the account need a password reset. Normally this would be your primary email address. Consider leaving this email address and password in your will or with your lawyer for backup. This email system can also help you in case of emergency or calamity, like a fire or flood. Scan important documents like passports, birth certificates, credit cards, insurance policies, deeds, wills, prescription and medical information and save them as pdfs. Next, email them to your executor account and label the messages as “emergency”. Now, if you ever lose your documents, you’ll have a digital copy that you can reference once you have an Internet connection. Furthermore, if you’ve managed to access the account in the aftermath of an emergency, you’ll have phone numbers and email addresses of your close personal network via the Contacts list to be able to send word of your location and condition. Some people have asked me about the long term stability and security of using Gmail to store their sensitive information vs. using another online service. Firstly, I think that it is highly unlikely that Google or Gmail will shut down any time soon. Stacked against the newness of some of the online ventures designed to keep my information, my confidence is with Google for longevity. As for data security, there is always a risk, no matter how small. If we’re talking about a random hack attack on Gmail vs. a random attack on a service specifically oriented to hold digital legacy information, the odds say that, just by pure numbers, the Gmail account would be less likely to be hit. However, some people are distrustful of Google’s massive size, web-based location and remain unsatisfied by their informal “don’t be evil” motto. Just as important paper files can be lost, stolen or destroyed, so can email and digital accounts be deleted, hacked or have their passwords misplaced. There is no perfect solution. Ultimately, it is up to each person to create a system that works for their own personal style and beliefs. What do you think, does the Gmail approach seem like a viable solution to you? What would you change? What are your concerns?